Running is a very active sport. Runners are well aware of the benefits they can get by just running a few miles every day. Running can lift your mood and also make you healthier in a number of ways. Running is great for anyone with high blood pressure, diabetes, osteoporosis, and those at risk of heart attack. How? It helps your arteries remain elastic so blood can flow without many obstacles and strengthening the heart. Aside from that, running burns a great deal of calories per minute, perfect for those who want to reduce weight or simply maintain their figure. Because running is a regular form of training for both military men and athletes, it is already proven that it can help build unrelenting stamina and endurance. However, it's not always a happy time when you're out running. Even a veteran runner can suffer discomfort from time to time. Everyone is susceptible to pain and discomfort when it comes to this high-impact activity. Running puts lots of stress and strain on the legs and feet. If you're not careful, you could end up seriously injured. Buy yourself the best insoles for running. Shoe inserts are great in averting injuries related to strain and pressure by providing maximum support and comfort to a runner's feet. First-time buyer can easily become confused about what insoles are and how they offer comfort to the feet. Today, we're looking at running insoles in particular. Running insoles are shoe inserts that you slip inside your running shoes as a replacement for sock liners. They aim to provide extra support and cushioning and also reduce the chance injuries due to the intense pressure to the muscles and joints on the limbs of your lower body. Since running is a sweaty sport, there are also insoles that can absorb shock and have an anti-bacterial technology. There are insoles specially designed to lessen certain foot conditions. The common foot conditions caused by intense running are overpronation, supination, plantar fasciitis, and fallen arches. Only 25% of people have normal running form. The normal running form is that their foot pronates well enough to absorb shock. The remaining 75% suffer from either overpronate or underpronation. This means that their feet have too much or too little at the heel-strike. However, gone are the days that they wonder about every running again. Orthotics can correct these issues by adjusting the angle at which the foot strikes the ground. They can prevent and cure a problem by decreasing or eradicating the stress. There are a lot of orthotics currently on the market. They may be custom made by podiatrists or bought over the counter. It is understandable that insoles may not cater to cater all of a runner's needs and preferences what with various foot conditions. Nevertheless, we present the top five best insoles for running through the extensive filtering of options from hundreds of brands on sale. If you are new to insoles, the first thing to do when you get your is to remove the sock liners from your running shoes. Sock liners are thin insoles that are just plain covers. Then insert your new insoles. However, don't go running from day one! Walk on your orthotics to get used to them until they finally conform to your feet. Bear in mind that an ordinary pair lasts 400-1000 miles and must be replaced for best results. This brand is great for everyday use, from hiking to running. This brand is extremely well established. 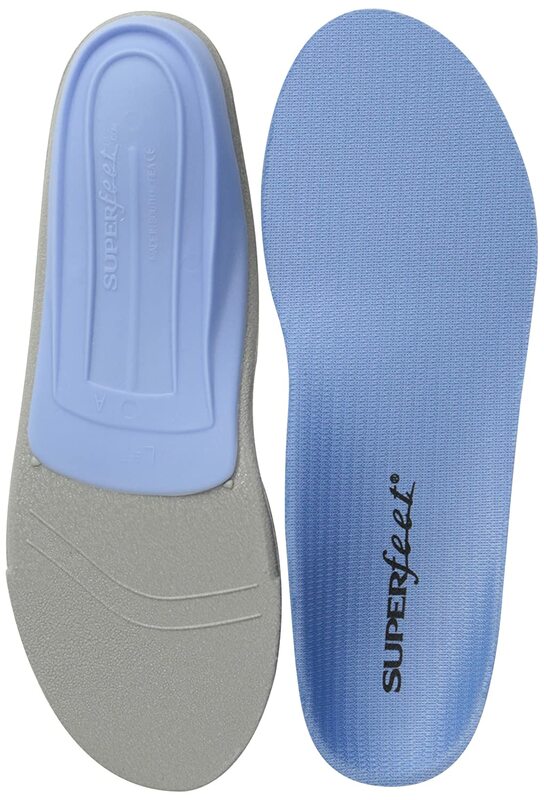 Superfeet have a unique design with their deep heel cup that protects your heel from shock. As it is a pain reliever, it also offers excellent support for your heel and back because of its shape that protects the major pressure points of your foot. 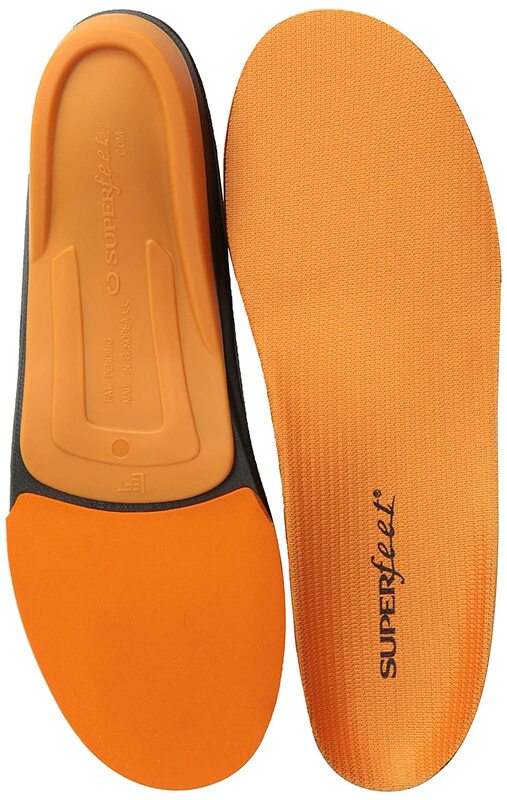 Superfeet give you the maximum control over your motion and also the greatest cushioning. 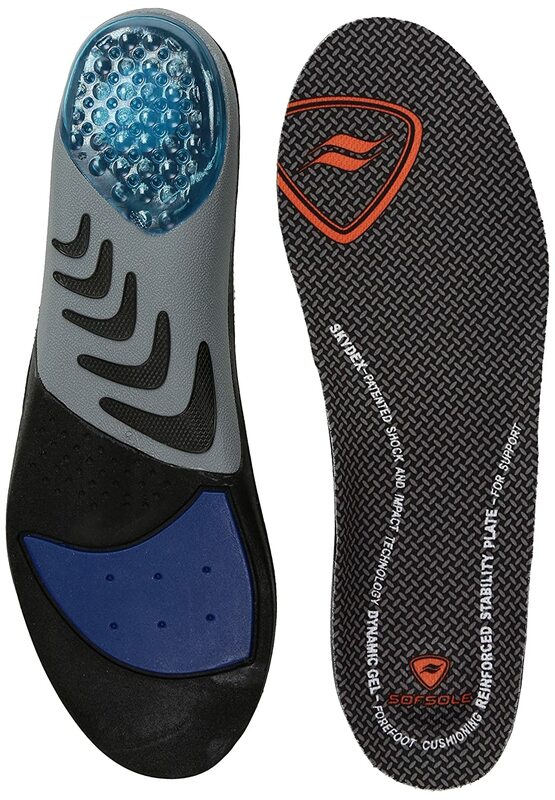 The shock absorption system includes control points at your midfoot and heel. 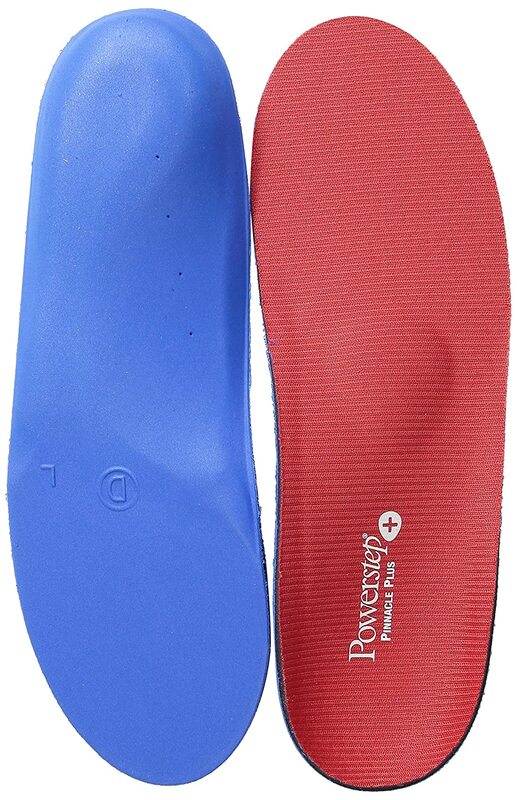 An economical alternative to custom orthotics, this original design by Powerstep became the template from which all other insoles by this brand were based. It has a totally encapsulated design that provides firm and complete contact support as well as a built-in arch support and a heel cradle for additional stability. These orthotics alleviates pain associated with plantar fasciitis, heel pain, discomfort, moderate pronation. Because they're ultra-thin and plain, they fit all casual and athletic shoes to offer the best foot support. The Powerstep brand takes pride in excellent customer feedbacks. Many users claim that after as little as four weeks, they start noticing an improvement in the support and in comfort of their insoles. Spenco is one of the leading brands in the insole market. They have every model suited for various uses. This particular model is unique because of their patented 3-POD Modulation System. This is done by positioning pods with different degrees of hardness beneath the main areas of the foot. 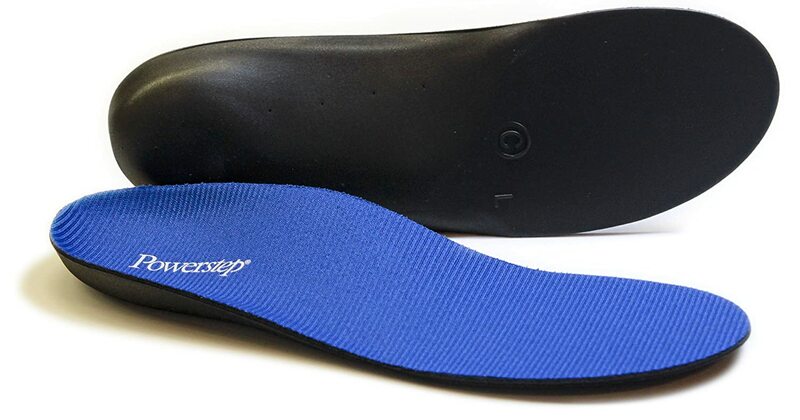 Overpronation is reduced by these insoles. They change the ground forces reaching the foot while running. This, in turn, increases the performance and provide superior comfort. Total Support Max is a rigid arch support for maximum stability. This is the perfect brand for runners who need harder, stiffer rigid support. They also have deep heel cups the same as Superfeet. These protects the foot from shock. Another model from Powerstep makes it into our top 5 list. This is perhaps the most popular Powerstep design because of its versatility and capability to ease the pain caused by various foot conditions. The Pinnacle is top notch for foot control, spring, and cushioning. What's more, these arch support insoles work wonders for increasing stability and comfort, whether running or working. Pinnacle has an encapsulated design with a support shell that is very firm and has support. It also has built-in foot support and heel cradle suitable for controlling motion and stability. The Variable Cushioning Technology (VCT) of Powerstep makes room for the controlled cushioning onto your foot with its dual layer. This design also boasts total contact support from the top fabric that promotes cool and dry feet and reduces heat and friction. This one of a kind brand has been getting a lot of attention in Amazon recently. These orthotics are the first heat-moldable custom footbeds introduced on this list. They take on the shape of your foot and are customizable according to your measurements unlike many other brands. SOLE products are ideal for running, cross training, and hiking. These insoles help relieve the pain caused by plantar fasciitis, flat fee﻿t, and bunions. SOLE has 3.2 mm of shock absorbing material called Softec. Aside from shock absorption, it also equalizes pressure distribution which is great for maximizing your comfort. To use this product is easy. Pop it into the oven for 2 minutes at 90⁰C then slip it into your running shoes. Step into with proper posture for 2 minutes and you're ready to roll. This insole is optimized for your running activity. It is designed to increase energy return which satisfies your needs for enhanced physical performance. Spenco integrates its PolySorb Anatomy to this insole which promises an excellent blend of shock absorption and energy-return. The 5/32-inch layer of SpenCore material made the shock absorption possible with an additional comfort and cushioning. Through this powerful combination, this insole provides long-lasting comfort regardless of your activities. lasting comfort means injury prevention and relief of foot pain. This insole does not only cater your running needs, but it is also ideal for walking, training, and sports. Through its proper contour and flexible support, your feet will feel cradled when in motion.You must not only expect improvement on athletic performance, but you must also expect extended life for your shoes. With an integrated Silpure Antimicrobial Technology for controlling odor, you must not worry about smelly feet after prolonged use. Apart from smelly feet, blisters will no longer worry you through this insole’s 4-way stretch nylon fabric. Motion comfort and extended life for shoes must be your top considerations.These features must also be an athlete’s “must-have” characteristics for their shoes. Through Spenco’s PolySorb insole, you’ll achieve these concerns. 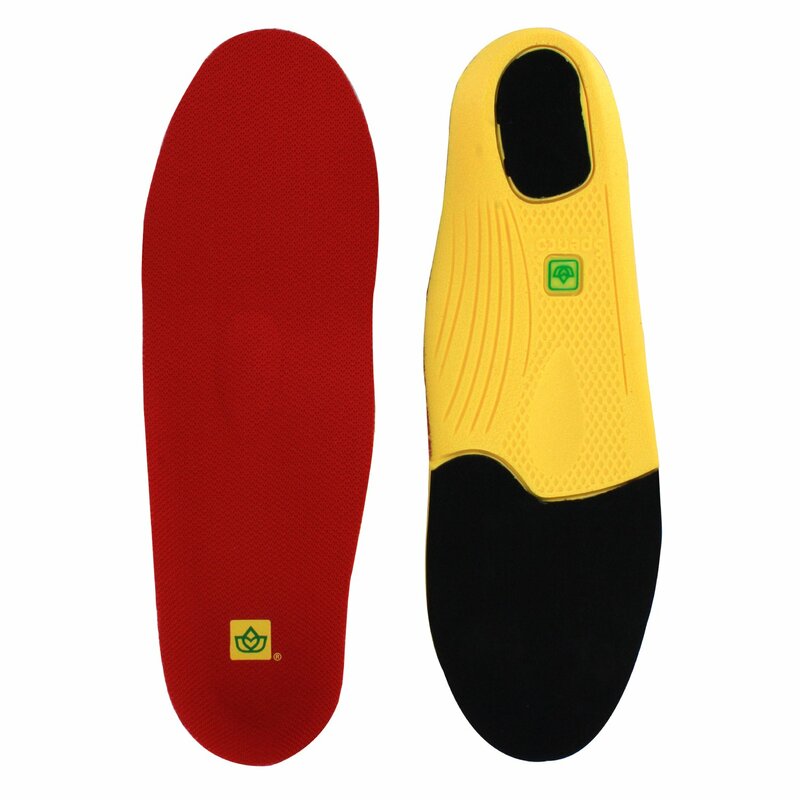 This is the only “2 pack” combination of insoles for your sport and casual needs. You may use both types interchangeably on-the-go! Both Sport and Casual Insoles uses memory foam which provides refreshing heel and arch support and cushioning for your feet. Memory foams are known to absorb those pain-inducing shocks. Also, its base is designed to prevent those irritating slipping of insole inside the shoe. Hence, you can now say goodbye to those pain which hinders your performance when running. 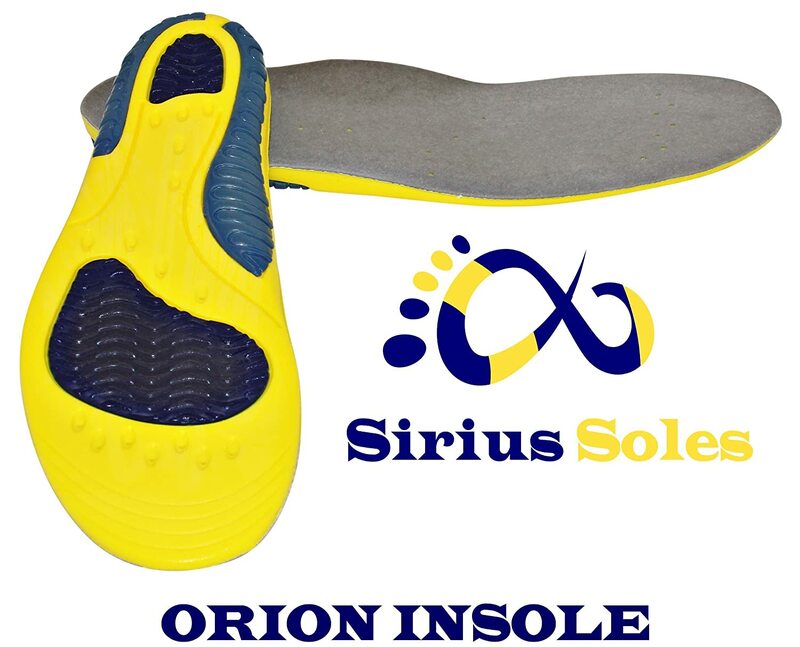 Aside from the Memory Foam Technology, SiriusSoles integrates a super soft felt surface on this insole. This enhances relaxation of your feet throughout the day. The Sports Comfort model enhances adhesive friction of insole to your feet through its integrated Micro-Bead Technology. This is a significant feature for maximum comfort when running. The design ergonomics of this insole will sustain all-day comfort. So you can enjoy extreme all-day comfort regardless of your motion. When you need enhanced traction for your physical activities, opt for their Sports Comfort model. And when you have a casual meeting after running, automatically switch to their Casual Comfort model. This combination will surely help you go through your day regardless of your activities. Nothing shall hold you back for an extra mile when running. Enhance your motion with this Airr Orthotic Shoe Insole. This insole uses nylon plate in the arch. It is designed for low-arched feet and flat feet types, though other feet types may enjoy the benefits of this insole. With an extreme support, your will never experience the usual arch pains again. Through the Skydex air bubbles, the heel and arch of this insoles enhance shock absorption. Every impact you get throughout your running activity will never leave imprints of pain. Invista’s COOLMAX fabric is integrated into the insole’s top cover. Even on extreme situations, this fabric absorbs moisture which makes your feet feel cool and dry regardless of motion. It is soft and breathable which allow quick absorption of moisture from the skin. When you choose to wash this insole, it dries up fast. Thus, this fabric decreases drying time and promotes energy-efficiency. 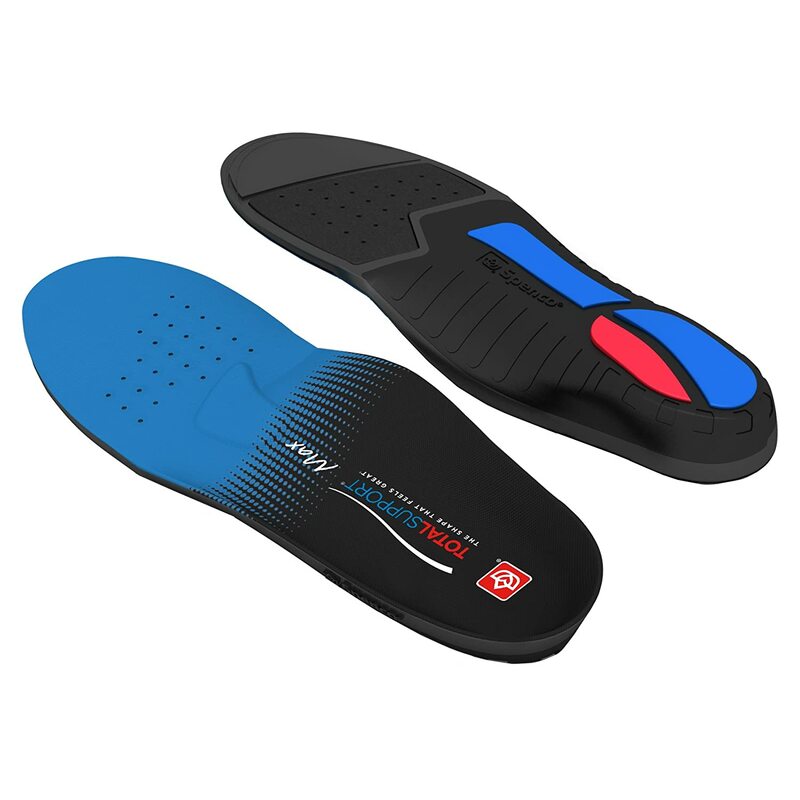 This insole has a strengthened stability plate which promotes motion control. This is also the reason behind its ideal support for low-arched customers. Through the combination of different integrated technologies, this insole delivers an ultimate cushioning for your feet. You will enjoy running for a longer time than you’re used to. If you are looking for an ultimate support for your feet regardless of your activities and your arch type, the New Balance Ultra Support Insoles might help you. Its cushions are built for everyday life, including running activities. New Balance carefully designed this insole to distribute your weight and pressure throughout your feet efficiently. To provide flexible arch support, this insole has separate cushions for heel and forefoot. This is deemed as a solution for arch problems for various feet types. The deep heel cup naturally cushions your feet. Also, the contours of the metatarsal pad are primarily designed to relieve plantar fasciitis, Morton’s neuroma, and metatarsalgia. If you are a runner with these problems, this insole might help you regain your running performance. Abzorb Cushioning is integrated on this insole for maximum shock absorption for your heels and your forefoot. 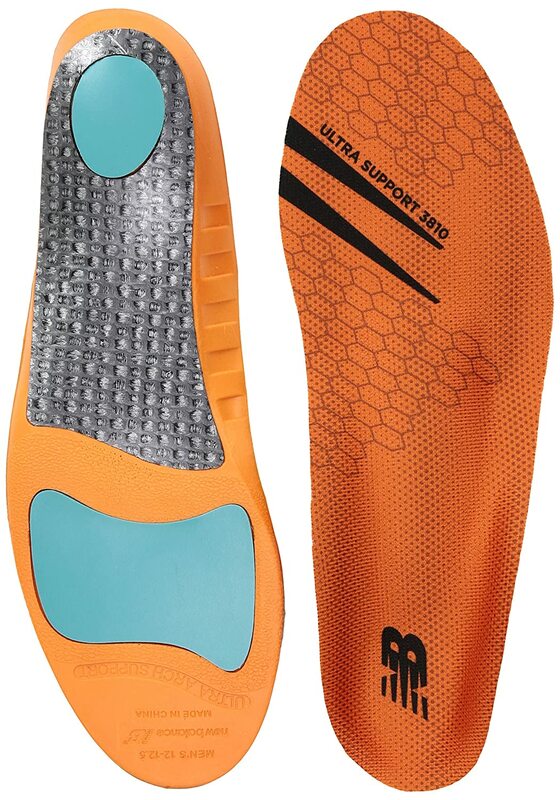 Also, this insole uses Anti-Blister Top Fabric Cover and MicroZap Anti-Microbial Top Fabric. When these two top fabrics are combined, it ensures your feet to feel cool and dry throughout the day without the worry of developing smelly feet. Through its custom made air flow channels, this insole assured you with an ultra-comfort for your feet. If durability is your concern, the Abzorb layers give you relief with its extra benefits. Compared to other forms of cushion, this does not break down fast. Abzorb layers retain the shape and flexibility of the insole despite its added cushioning. Designed for high-impact activities, this premium insole is ideal for people who experience extreme pain when running for an extended period of time. Due to its responsive full-length foam layer, you can pound your feet to the next level. Sensitive full-length foam layer has a closed-cell foam which provides a long-lasting comfort for your foot. When it comes to sustainability, closed-cell foam defeats open-cell foam. This layer can be found on the insole’s supports and cushions. In addition, it works perfectly with the high-impact foam. This provides greater shock absorption when you are executing huge impacts for your foot.In spite of great impact, the insole remains durable. With careful contours and design, this insole stabilizes and supports the foot through its deep, narrow heel cup. There’s no more pain for your feet, ankles, and knees after a prolonged running activity. Environment-wise, this insole is naturally coated with latex-free materials. Also, typical materials like nickel sulfate, formaldehyde, and preservatives are forbidden from this insole. Add up the Agion antimicrobial treatment and friction-control coats; you’ll obtain a smell-free and blister-free feet after your running session. Before moving to the central topic of this article, it might be useful for you to know what kind of disorders you might face when running and wearing wrong insoles. Overpronation happens when the outside of your heel is the first part that makes contract to the ground. The foot rolls inward more than the usual 15% which means that your foot and ankle have problems in steadying your body. Also, in this condition, shock isn't efficiently absorbed. When you run, the forefoot that consists of your big toe and the second toe do all the work to push you off to the ground. Overpronation often leads to other foot conditions like plantar fasciitis, flat feet, heel spurs, metatarsalgia, and bunion among others. This is because the form of your arch collapses which adds stress to the other parts of the foot. To combat this, you are advised to wear straight or semi-curved lasts for shoes. Look for stability shoes with features that limit pronation, and buy orthotics. Another term for underpronation, supination happens when the outside of the heel is the first to make contact with the ground. As such, there is insufficient inward movement after landing. The impact force is concentrated on the outside part of the foot and is not evenly distributed. When you start to run, most of the work to push you off the ground is done by the smaller toes on the outside. Since supination places more stress on the foot, it can lead to Achilles tendinitis, plantar fasciitis, and impaired stability. To prevent this, wear shoes with curved lasts, wear lightweight shoes for more foot motion and get yourself the best running insoles. What orthotics do your feet prefer: more on comfort or more on support insoles? Comfort insoles are for those people who are on their feet all day, tired from standing on concrete for long periods of time. They may eventually find relief in this type of insoles because of shock-absorbing feature designed for coziness. These insoles can be made from gel or foam. They can be flat or contoured. If you feet still ache and don't find relief from these orthotics, it is an indication that you need more support, not more cushioning. Support insoles aim to provide support and stability to the wearer. This means they can be constructed from a harder material. Comfort is derived from the stability that the cushioning provided. Support insoles are for those who have structural misalignment, plantar fasciitis, supination, and overpronation. Before choosing the best insoles for running from our list, why don't you check out these guidelines? After selecting the type of insole and brand, check if your chosen insoles are comfortable enough. Comfort is important in a high-impact sport like running. You must buy insoles that won't cause pain so that injuries can be prevented. Though there are trim to fit insoles, it is still a better move to buy them according to your size. Poor fitting insoles are useless if they don't fit inside your running shoes, and they can lead to injuries. Consider the lifespan of your prospective brand. Will you get what you paid for? Since running is a very active sport, you may have to replace insoles after running 400-1000 miles or depending on the rate of degradation of your insoles. Worn-out insoles put you at risk from injury. We hope you have enjoyed these review of the best insoles for running. You can easily avoid the foot conditions introduced in this article if you get yourself with the best insoles the market has to offer. Run with renewed vigor with some great orthotics. Feel free to get in touch if you have any question or feedback. We are more than happy to help. 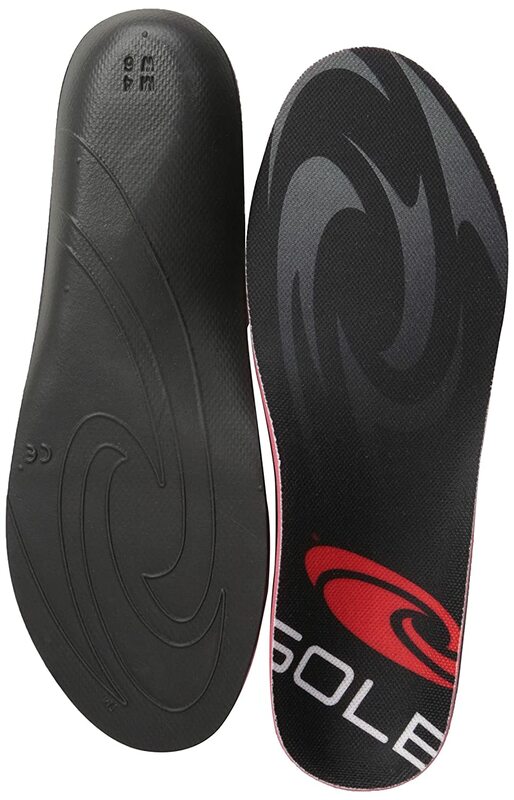 This insole features a stabilizer cap for the base. Your foot is fully supported without sacrificing the structure and strength of the foam layer.